I’ve been thinking for a little while about posting a “Castle of the Week”, and I guess as its the Queens birthday and there is loads of attention on one of England’s bigger and more famous castles, I could start this today! 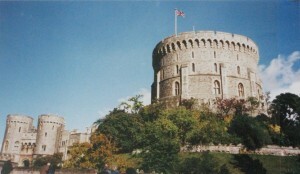 Windsor Castle was founded by William the Conqueror on the edge of a well-established royal forest of the Anglo-Saxon kings, and originally consisted of a mound with a wooden tower on the top, and a small enclosed area around the base. It was built on the banks of the Thomas on a high terrace. An existing royal palace at Old Windsor was probably the chief residence at the time, with the castle serving a purely military function. By the end of the reign of William II Rufus, two further baileys had been added, to east and west, with the motte occupying the central point. In 1110 King Henry I decided to use the castle as a residence, staying occasionally. Wooden piles were inserted into the motte, and the timber building were replaced by a stone shell keep with bulidings inside, and an outer defensive wall around the edge of the summit. It has been suggested a partial collapse of the motte took place, but perhaps this was due to the new construction on the top. Between 1165 and 1179 Henry II replaced the timber palisade around the eastern bailey with a stone wall and square towers, and replaced the stone shell-keep and wall, which were subsiding and had cracks in the walls. In addition he reinforced the motte structure itself. 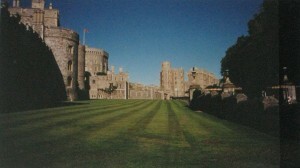 Late in the reign of King John, Windsor was besieged twice and damaged, and early in the reign of Henry III the western bailey was also enclosed in stone, with new round towers, a new gatehouse, and the area around the base of the motte (known as the Middle Ward) was also enclosed in stone. Between 1240 and 1263 Henry built a new palace along the north wall of the eastern ward, as well as a range in the western ward which became his favoured residence, and the Lady Chapel. Between 1350 and 1377, Edward III built a massive new palace in the eastern ward costing £51,000, and made Windsor the most impressive royal dwelling in the country. Despite the political violence in the 15th century the castle was not attacked, but was a symbolic site, with Edward IV founding St Georges Chapel as a statement of his dynastic permanence in 1475. The castle was extensively remodelled by Henry VIII, and remained the residence of choice for most of the monarchs since then. During the interregnum of the 17th century it was inhabited by squatters and damaged, requiring significant repair work once Charles II came to the throne. Monarchs since then have redecorated and redesigned the castle as one of their private residences. In more recent years subsidence in the motte was identified again, requiring stabilisation work, and the fire in 1992 caused damage to the 14th century palace in the eastern ward. Today parts of the castle are open to the public, and it remains one of the official residences of the Queen. It is one of the most visited attractions in the UK, and the largest inhabited castle in the world. I haven’t been there for many years – these are the few photos I have from then – taken as snapshots before digital cameras had been invented, apologies for the blurriness! 🙂 So, this week, my Castle of the Week is Windsor Castle.